Another from Newcastle City Libraries archives. From the caption at the bottom, the location is West Clayton Street Newcastle, which is literally just round the corner from the Central Station. The date is 1952; the buses are lined up ready to depart for Gosforth Park Racecourse, about three miles north of the City. I suspect it would be on the day of the Northumberland Plate, know as the Pitman’s Derby, this race meeting always attracts huge crowds, and is run on the last Saturday in June. 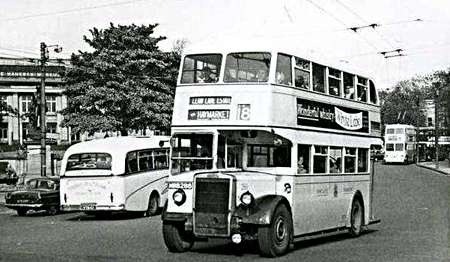 An interesting line up, headed by an all Leyland Titan PD2/3 from 1950, NVK 304; then two MCCW bodied Daimlers, the one in front is one of the 1947/8 KVK registered CV6G series, the second could be from the same batch, or it could be a 1938 FVK registered CW5G. Next in line, looks like a 1947/8 Roe bodied Daimler CV6G, they were also KVK registrations. Looking at the outward swoop of the lower body panels, my guess would be that number five is a 1946 Weymann bodied AEC Regent II. I can’t make out enough detail to have a stab at the rest. A very appetising line-up! 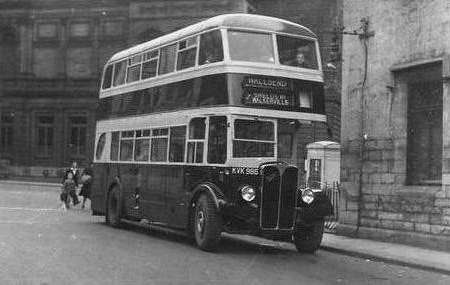 Never realised until recently that Newcastle had had any Birmingham-style MCCW-bodied Daimlers. How did that come about? One of my very favourite bus designs, by the way. I believe Newcastle Transport was desperate for new stock, and Daimler and Metro-Cammell could offer quick delivery. The bodies were to Birmingham spec, including the single aperture front destination blind, though livery and upholstery were to Newcastle standard. They were delivered in the blue and cream livery. There’s a photo of one in the later yellow and cream livery but with its Birmingham style indicators in Alan Townsin’s Best Best of Brirish Buses volume 11, post war Daimlers. The destination blinds must have been changed to the standard Newcastle pattern quite quickly. I’ve seen a photo of one on Facebook dated 1950 so,fitted. There is a follow-up to this post with pictures at this link. A 1950 H30/26R all Leyland Titan of Newcastle Corporation. One of 52 of the type delivered between 1948 and 1950. The all Leyland Titan was well built and reliable, and as good a looking vehicle as anything else that was around at the time, but sometimes its what’s in the background that makes a photo interesting rather than the subject matter itself. NBB 286 is heading south towards Newcastle City Centre and is about enter Barras Bridge. 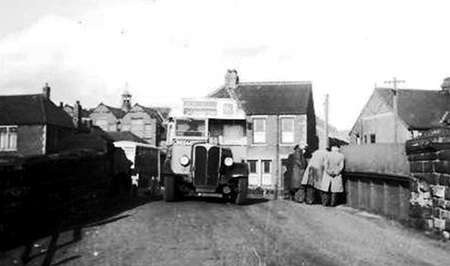 The large building is the Hancock Museum, which is at the junction of Claremont Road, what looks like a Duple butterfly ’chassis unknown’ heading north on the Great North Road, which at that time was still the A1. A 1949/50 MCCW bodied BUT 9641T trolleybus is coming out of Jesmond Road, so the year is pre 1966. Behind it is a Percy Main vehicle which will be on the service 3 – 5 or 11, it could be either an Atlantean or a Weymann bodied Daimler Fleetline. One Titan from the Newcastle fleet has survived LVK 123 and is in its original 1948 blue livery, but bearing in mind the number that were produced, it seems that not that many are still around. Ronnie, I think that this photograph was taken before May 1965 when the trolleybus services along Jesmond Road were converted to motorbus operation. I always thought that there was something magical and special about the cypher A1 and name ‘Great North Road’. Over the years the A1 has had quite a few different routes through Tyneside and the numbers now allocated to former sections of the route give few clues to their former glory. Before the D.V.L.A. It seems to have been common practice that local authorities would issue registrations to bus companies En-block which would then be allocated as and when required, as a result, vehicles which were two or three years apart could have registrations which were numerically quite close. Unfortunately, I do not have access to their fleet records, but Newcastle Corporation would seem to be a good example of this. Newcastle registrations were BB – TN or VK. Post war motor vehicles were AEC, Daimler and the all Leyland Titans, bodies came from a number of sources including, Massey. MCW. 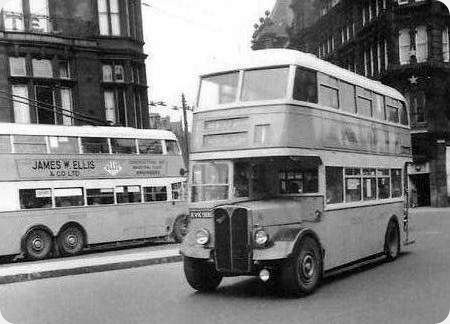 Northern Coachbuilders, Park Royal Vehicles, Roe and Weymann, then of course there was the trolleybus fleet. I am speculating here, but it would appear they had most of the registrations between KVK 950 or thereabouts, and LVK 140 ish, but they were allocated between 1947 and 1949. My information suggests that among that number were three 1947 AEC Regent III with H31/25R Roe bodies KVK 984/6 – 84/6. Sorry, I don’t have any further details, I know Newcastle Corporation Transport had some pre-select Daimlers, but I’m inclined to think that these were a 7.7 litre with a crash box. 86 is shown here in its original 1947 blue, and again in the post 1949 yellow livery which had previously been the sole preserve of the trolleybus fleet. The Roe body was one of those timeless classics that would look good in almost any livery. I rather think that as well as those bodied by Roe, the MCW bodied Daimlers also had a window on the stairs, but if memory serves, at some stage they were all either removed or painted out. Birmingham (JOJ) and Glasgow (FYS and SGD) reserved large blocks of registrations which were issued over several years. Almost all the FYS block was issued to buses and trolleybuses over the years 1949 to 1958, followed by SGD 1958 to 1964, when the year-letter phase began. Devon issued LTA registrations to Western/Southern National for buses new between 1949 and 1953. In Leeds while the buses were registered in blocks there was never a special series for them On the other hand all the city council ambulances were given the registration — 999! In complete contrast West Yorkshire never used blocks of registrations even for a single batch of buses being quite content to take what the licensing office offered and if the number matched the fleet number it was very definitely good luck and not good management! Nottingham (after WW2 but not before) invariably had blocks of reg numbers that corresponded to the fleet numbers. All were in the KTV series until the big fleet of 72 Regent/Park Royals, supplied in 1953/54, took OTV 127-198, assuming the fleet numbers of Regents supplied 1934-36. Even then there was clearly some agreement with the licensing authority, since these followed on neatly from the 1949 series of Regent/Metro-Cammells KTV 97-126, which in turn took on fleet numbers previously carried by defunct 1931 Regents. Portsmouth Corporation seemed to use whatever registrations were available in the pre-war and early post-war period. I suspect that the 1939 Leyland Cheetahs were numbered 41-46 to coincide with the allocated registrations BBK941-946. Post-war, Crossley DD42/5T No 28 was also coincidentally registered EBK 28. The others of the batch (EBK 23-27) carried numbers 11-15. The Corporation was "gap-filling" it’s number series at this stage. In the 1950’s, the Corporation had a policy of booking registrations in batches in ending 999. Thus we had 25 PD2s GTP 975-999 (58-82, 1952); 25 PD2s LRV 975-999 (83-107, 1956; 15 PD2s ORV 985-999 (108-122, 1958); 5 PD3s STP 995-999 (123-127, 1959), and 10 Tiger Cubs TTP 990-999 (16-25, 1959). After this the Corporation booked registrations that matched the fleet numbers in what was becoming the "normal fashion" across the industry from the 1960s (although I accept it wasn’t universal practice). As referred to above, it was usually ambulances or fire engines that had a "999" registration, not buses. The buses registered with a "999" didn’t go any faster than the rest, but 122 had a different and marvellous sounding exhaust note during it’s early life – certainly until c.1964/65 – very sporty! . The West Yorkshire Road Car Company did use year block registrations in the period 1934 to 1939 and again from 1946 to 1956. An example for 1935 illustrates the method used. YG 8968 – 9015 registration marks were used for Dennis Lancet 1, Dennis Ace, Bristol G05G and Bristol J05G types. Another example used in 1952/53 were LWR 405 – 435 registration marks issued for a Bedford van, Bristol LS6G, Bristol KSW6B, Bristol KSW6G and Bristol LS5G types. Other letter groups with mixed bus types were BWT, CWT, DWU, EWY, FWX, GWX, JWU, JYG, KWU and OWX. I have omitted AWW as one mark missing in the sequence was AWW 160. After 1956 this practice of mixed bus types in registration groups ceased and shorter runs as described by Chris H were then the norm. I remember in 1967 Nottinghamshire used a block of registrations across 3 companies which as a youngster I thought unusual. SRB 81F to SRB 90F Chesterfield Corporation Panthers. Mansfield District and Midland General were linked so possibly you could argue it was 2 companies. Does anybody remember anything similar elsewhere? Interesting, David – especially as Chesterfield is in Derbyshire! I wonder if the Panthers were an order that was actually diverted to Chesterfield for some reason? In 1967 wasn’t RB a Derbyshire registration? It only became Nottinghamshire later. ‘RB’ was a Derbyshire mark, and the Chesterfield Panthers naturally received Derbyshire registrations. Midland General/Notts & Derby vehicles were registered in Derbyshire up to c.1972, then Derby CBC in 1973/4 (was this after the Trent ‘takeover’? ), then Nottingham LVLO. Mansfield & District vehicles were registered in Derbyshire from 1967 to at least 1970. Interestingly, the Chesterfield Panthers were fleet numbers 81-90, following on from Roadliners 71-80, so it may have been the Panthers which somehow dictated the above sequence. I am sure there would have been many more instances of bus registrations following on from one fleet to another, not least because bus and coach registrations once constituted a much higher proportion of the total than they do now. Off the top of my head I recall that (c.1950) DRN241-90 were Ribble 1301-50 and DRN291-310 Preston 8-27 (all PD2s); DRN341-54 were Ribble 284-97 (Sentinels) and DRN355-67 were Scout (Royal Tigers, PD2s, and a Bedford). Don’t forget that there was ostensibly no corporate connection between Ribble and Scout in those days. Newcastle Taxation Office allocated reversed JVK exclusively for Newcastle Corporation Transport buses and other municipal vehicles. The mark was first issued in November 1959 and remained in use until December 1963. Newcastle commenced suffix marks on 2 January, 1964. One of the most intriguing registration features was Liverpool which issued FKF to Liverpool City Transport buses covering the D, E and G suffix. Newcastle Corporation in fact had a pretty good record of matching registrations and panel numbers, as they called them, but only from 1937 onwards. That year saw the arrival of 174-95, Daimler COG5s with MCCW, NCB or EEC (low-bridge) bodies, registered FVK 174-95. The practice continued up to 244 then fell away a little for numbers 245-50, utility-bodied vehicles delivered in 1942 and 1943 as JTN 505/6, JTN 607/8 (Guy Arabs) and JTN 619/20 (Daimler CWG5s). A new numbering series started from 1 in 1945 but single and double digit registration numbers generally weren’t used. Buses up to 86 had three-digit registration numbers, with the last one or two digits matching the panel numbers. Perhaps in those days there was already a demand for ‘cherished’ low number plates for the few who could afford a posh car to go with them and had the influence to fix it when registering their vehicles! 1 to 86 were registered JVK 421-5, JVK 613-58 and KVK 959-86. Note the gap 6 to 12, more of which anon. From no. 87 onwards the numbers were synchronised. It’s not really the case that use of the KVK 9xx series was spread over several years. It only covered 3 batches of vehicles in the 59-86 range (59-72 the fourteen Birmingham-style CVG6s, 73-83 eleven more CVG6s with Roe bodies and 84-6 the three Regent/Roes you refer to). These were delivered out of sequence; the two Roe bodied batches in mid-1947 and the Birminghams in mid-1948. More interesting in terms of variety is the 13-58 range, covering no fewer than five batches, all registered JVK 613-58 and delivered between December 1945 and June 1946. Eighteen of these, 41-58, were the single-deckers required for tram replacement on the Scotswood-Throckley route where the narrow and fragile road bridges at Lemington, from which the trams had long been diverted, precluded the use of double-deckers. Of these, eight were Guy Arab 5LWs with Massey bodies (51-58) so that’s another marque to add to your list! 41-50 were AEC Regal/Harringtons. Here’s an undated pic of Regal 41 or 44 on what looks like an inspection visit to Sugley Bridge at Lemington. I think that’s a Regent/Park Royal semi-utility of the 37-40 batch lurking in a side street. All those buildings in the background still exist. As regards 84-6, I THINK that they might have been part of the small number (70?) of London Transport RT specification chassis released to provincial operators in 1946/7. 84-86 had the RT chassis designation 0961. Provincial Regent IIIs were allocated 0961/2 in 1947, later to become 9612. See Non London Transport RTs for more background. Here’s a higher resolution zoom-in of your shot of 86 showing the gear pre-selector just below the steering wheel. Squint and you’ll see it! All in all Newcastle took delivery of 245 motor buses (1-11/3-136, 164-73, 251-350) and 186 trolleybuses (443-628) from 1946-1950, enabling a clear-out of many pre-war vehicles and of course the last of the trams in 1950. 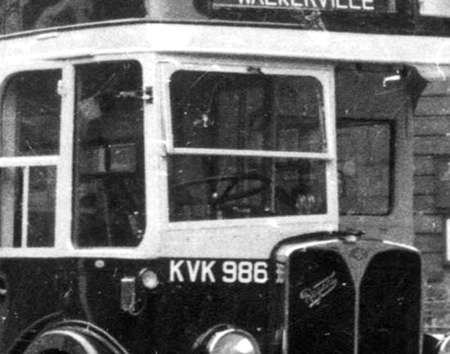 Note that the new panel number series that started in 1945 had reached 136 by 1948 but with a further 100 buses due for delivery in 1949 and 1950 the 60 or so surviving pre-war vehicles (147-250, with gaps) would have required re-numbering. This was avoided by switching back to the original 1-250 series and using 251 to 350 for the 1949/50 deliveries, with 164-73 (see question 2 below) later becoming 364-73 when new AEC Regent Vs arrived in 1956. You’ve guessed it – the AECs were numbered 137 onwards… Just to spoil the story, 351-3 (PD2/Orions) had appeared in 1954 as UTN 851-3. 1. Why was there a gap from 6 to 12 in the post-war panel number series? Newcastle had managed in 1945 to acquire five Daimler CWA6 chassis numbered 1-5 (JVK 421-5) and fitted them with second-hand pre-war bodies in 1945/6/7, then re-bodied all five at Mann Egerton in 1950. The next new vehicles to arrive after 1-5, in late 1945, were numbered 13 onwards. The 6-12 gap was eventually partially filled four years later in 1949 when six all-Leyland low-bridge deckers arrived, being numbered 6-11 and somehow acquiring matching registrations LVK 6-11. Was a batch cancelled before delivery c1945 that might have become 1-12 (or 6-12) and if so what were the details? Many local taxation offices used 1-99 for motor bikes or local authority vehicles. North Western had LDB 701-LDB 800 allocate in January 1957 and used LDB800 in mid 1960 by which time Stockport was issuing RDB, again NWRC. was allocated a batch which took about 20 months to use. Manchester Corporation was allocated JND 601-JND 800 in the autumn of 1948. JND 751-JND 800 were used between 10/48 and 02/49 on a batch of Crossleys. JND 601-JND 700 appeared on a batch of PD2s split between MCW and Leyland bodies between 05/51 and 02/52. In the meantime, JNA 401-JNA 500 had appeared on a batch of MCW bodied PD1s between 01/49 and 05/49! JND 701-JND 750 were allocated to a batch of Daimler CVG6s, bodied by MCW which arrived between 09/50 and 03/51. In 1953 Manchester received the allocation of NNB 101-NNB 299. NNB 101-118 and 120-125 were placed on a variety of Northern Counties bodied Royal Tigers. 119 and 126-129 were not used. 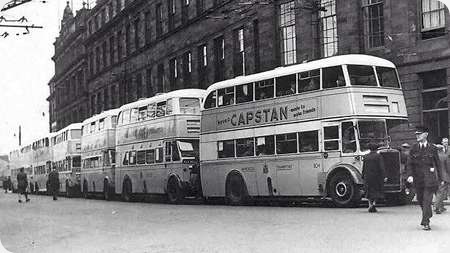 The buses were delivered between 05/53 and 10/53. NNB 130-NNB 135 were also Royal Tigers with Bond and Burlingham airport coaches, delivered 08/53 -10/53. NNB 140-NNB 169 were PD2s with NCME bodies delivered between 11/53 and 06/54. Previously NNB 170-NNB 209 had arrived between 07/53 and 10/53 as PD2s with Leyland bodies. NNB 210-NNB 299 were Daimler CVG6s split between 80 MCW unique to Manchester bodies and 10 MCW Orion bodies delivered between 11/53 and 02/55. The unused NNB 136-NNB 139 eventually appeared in August 1956 on Tiger Cubs with Burlingham airport coach bodies. After this, registration batches were requested once a delivery date was firmed up so registrations were very much in date. There was one last glitch. Fleet lines 4701-4760 should have been delivered as DNF 701C-DNF 760C in 1965. Late delivery meant that only 4701-4706 arrived in 1965. 4707-4712 arrived in January 1966 and 4713-4730 arrived in February. The registrations had already been allocated so the vehicles were all taxed in December 1965. The delays continued and 4731-4760 were then allocated FNE 731D-FNE 760D. 4731-4740 all arrived in December 1966. 4741-4760 were not delivered until January 1967 but were taxed in December 1966 to avoid a registration change. Stockport Taxation office allocated DB 5000-5299 to North Western Road Car Co. issued over the period February, 1924 to March, 1929. This was followed by the block DB 9301-9500 between March, 1929 and March, 1932. Stockport completed the general DB sequence in 1930 and this superseded by JA. On the other side of the Irish Sea, Coras Iompair Éireann frequently booked big blocks of Dublin registrations, as did its predecessor the Dublin United Tramways Company. However, P47 ended up being registered ZJ 1182 instead of ZH 6317. I’m guessing it did not enter service as soon as it was delivered, but was instead stored for some time beforehand. P242 ended up being registered ZO 9646 instead of ZJ 5982 – again, I’m guessing it was stored for some time before entering service. …then in blocks of just 60 until 1961. However, in 1964, it booked EZH 1-255 for its first C-class Leopard PSU3s, which became the first vehicles to carry matching registrations. Then in 1966, it booked its biggest block, VZI 1-340, for its first D-class Atlanteans. In 1967, it booked EZL 1-230 for its first SS-class Bedford VAS5 and SB5 school buses. PZO 261-522 were booked in 1968 for SS261-522, followed by UZU 523-646 in 1969 for SS523-646. Reversed registrations began in 1970, and CIÉ wasted no time in booking 1-213 IK for its M-class Leopard PSU5s, and 341-410 IK for Atlanteans D341-410. In 1972, 411-554 ZD were booked for D411-554, and in 1973 701-770 ZI and 603-753 ZO were booked for SS701-70 and D603-753 respectively. By this time, CIÉ’s relationship with Leyland was deteriorating, and so a lull followed until the tie-up with Bombardier and GAC. In 1981, 2-201 JZL were booked for Bombardier double-deckers KD2-201, followed by 202-300 OZU in 1982 for KD202-300. Finally, in 1985, EZV 2-120 were booked for GAC rural buses KR2-120 (the ZV code had been allocated to Dublin in 1981 along with SI, ZG and ZS, as it was running out of registrations featuring its original codes). By then, the current year-county-serial registration system was on the horizon, as was the transfer of CIÉ’s bus operations to Dublin Bus and Bus Éireann. Bit late to this discussion on registration numbers but a bit of information on Burys numbers. Until the 1949-50 batch of PD2/4s were delivered the fleet numbers and registrations did not match. This group of 25 buses were 151 to 175 and the registration numbers were EN 9551 to 9555 and 9956 to 9975. From them on the fleet and registrations matched with the next ones being BEN 176 to 186,the single Deckers were then numbered in a separate series, the AEC Reliances being 81 to 86 and registered FEN 81 to 86. The numbers continued to match until the year suffix letters were added which started with C as Bury didn’t use A or B letters. The 1965 Fleet lines were AEN 832 to 837C, which were 132 to 137. Finally,at the very end of its existence in 1969 a new numbering series started at 1 with Atlanteans 1-3 being KEN 231-3G.